The reality of getting ready to ask the woman you want to spend the rest of your life with to marry you is probably (I can only assume) one of the most terrifying and also one of the most amazing moments you’ll ever experience. I’m sure you have envisioned it for months, years, or if you were even one of the lucky ones who just knew from the moment you met her. You have probably thought about how she will react, if she will even be able to get out the word Yes in between tears, or even if she will approve of your 3 months of salary sitting in that little box. Either way… this is it. So you bought the ring… you have the perfect location picked… and you have played it out in your head at least 20 times since this morning when you woke up and grabbed your coffee thinking “holy crap today is the day”. As a woman myself I feel I am just going to call myself an expert in the field of being a hopeless romantic. Albeit more hopeless than romantic at times, I feel like most women aren’t all about the glam, over the top proposal that you might think. Now don’t get me wrong… there is nothing wrong with renting a hot air balloon and taking the love of your life up in it to ask her to marry you, all while throwing Swarovski crystals off the side of the balloon. However the rest of us women who like to keep our money in the balloon and the smile on our man’s face from not going into debt from a wedding proposal have a much more simplistic expectation on when it comes time to say Yes to that life altering question. No matter how you decide to get down on one knee there are a few must know’s from the other side of that question that are crucial in getting it right. Here are what women want/need you to know before popping the BIG QUESTION. This seems pretty self explanatory however you would be shocked at how many times I have met and seen brides newly after getting engaged and they awkwardly tell me that their ring is being sized. Whether we want to admit it or not, not being able to show off “the rock” is like wanting to cry every time someone asks us. We will have our perfect response done up “oh yes it is amazing wanna see a picture? It is getting sized right now but we will have it back in two weeks”. As great as photos are… nothing beats the real deal. So you are probably thinking how do I get this without completely tipping her off? 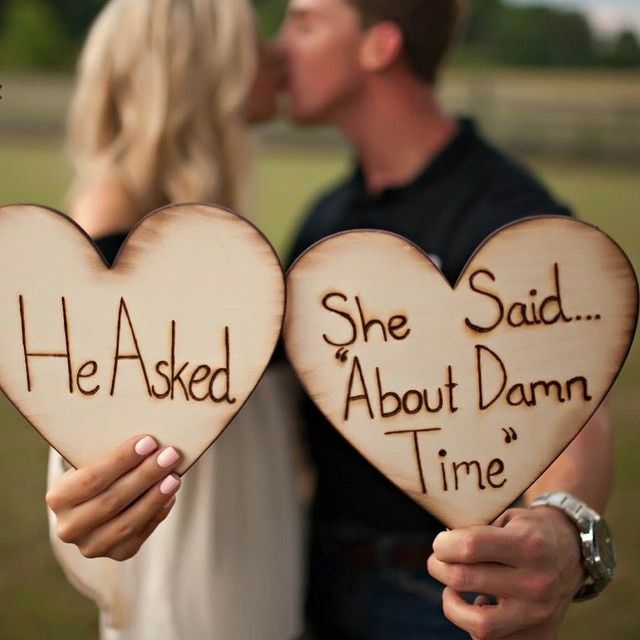 If you are going to be sharing your big news with the family prior to popping the big question, ask her mom, sister, or another close female relative. You would be surprised how much us women know about each other. I can tell you my sister could give you my ring size (7), my shoe size (9), and the size of my pants (nice try). Pay attention. If you see her wear a ring on her ring finger and it’s not of any value. GRAB IT. Now…. just to be clear… please don’t grab her grandmothers ring she wears on her ring finger until the day it is replaced with yours. DO NOT DO THIS. She will be devastated she lost her grandmother’s ring and you will feel awful. If you are unable to hijack a ring, simply put it on one of your fingers while she is away and that way when you go to order her ring you have a very good idea as to what size she is. 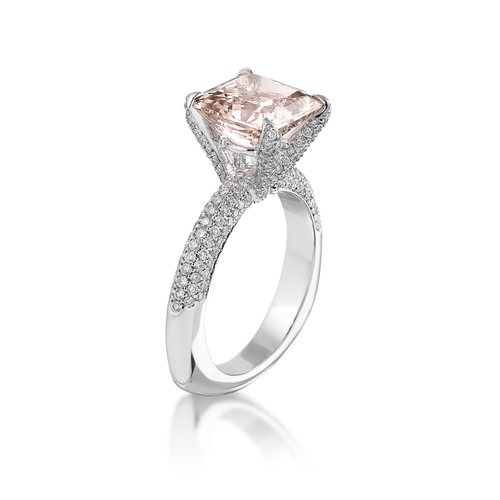 Jelewers like Jared The Galleria of Jewelry and James Allen are experts in their field in helping you with questions about sizing and even how to make sure you are getting a ring that can always be sized later on if need be. If your special lady is into hiking, outdoorsy things, and isn’t really into the hustle and bustle of the city life… probably not a great idea to fly her into New York City and ask her on the Jumbotron on New Years Eve. This isn’t about you. I mean come on… it is a little… but you love this woman. This one moment has to be about the fact that she is the one. Some tips on finding out where and when to ask the big question. Do you have a “thing”. Ok yes, that is vague. Work with me here. Do you have a weekly ritual where you eat pizza together and talk about your week? Where did you meet? Do you have a song? Is there something significant that happens and makes you think of her. These are the “things” that are going to score you points when getting ready to ask her spend the rest of her life with you. Have you talked about your future? If you are like me… patience is not a virtue. So the need to talk about the future is a must. 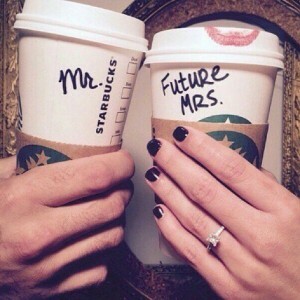 Try to think of things you have dreamed about together and incorporate that in the proposal. 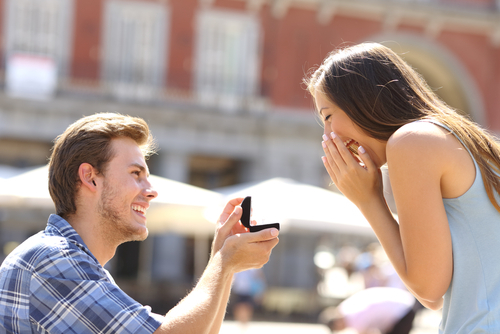 Are you close with her family to where it would be important to involve them in the proposal. Alot of women tend to veer on the side of romance (including myself) and value the aloneness that comes with such a big moment. However, there are alot of families who have beliefs on being incorporated and this will be key to know before going into it. Not every woman wants to be proposed to in the back of a vehicle serenaded by her dancing family, however some women do. It is imperative you know her style before you can make a jump into a Chorus Line production. By the way, how cute is this guy? Ok let me rephrase… the bigger the love the better. The bigger the need to be with the love of your life… the better. And certainly the bigger the passion… the better. However, women don’t really care about the size of the ring. If you have one that is requiring you to purchase the new 3 ct. diamond, pear shaped, with rose gold engravings… maybe let’s rethink the proposal a bit eh? The reason I say that is not to be harsh it’s that women don’t care what is on their finger. I have always said… when the right man came along you could throw a zip tie on there and call it good. Focus on what is important to her, and to your budget. I am sure by now you have at least thought a little about budget. According to The Knot couples are now a days opting out of the traditional “3 months salary” ring budget and going dutch on the engagement ring. Call me old fashioned… but I don’t want to know when it’s coming so for me this probably wouldn’t work. However, it is something to think about having a “what-if” question over. Women don’t want to start a life together with a lifetime in debt. Trust me when I say I speak for all women when I say that seeing our man happy and not stressed in debt over a giant rock is really what we want. As much as you have been planning, thinking, and imagining for however long we have been wondering, daydreaming, and getting anxiety before every major trip thinking this MIGHT BE IT. We are in the same boat chief. When you are getting ready to get down on one knee our entire relationship flashes before our eyes. Every kiss, every late night text message, everything Boom in a two minute window flashes. We also have thought about this moment at length and are just as nervous that we might accidentally spit in your face while we are blubbering. Have a shot of whiskey, don’t think about the moment ahead, and think about the lifetime ahead instead. You can do anything for 10 minutes. Do it. By now if you are thinking about spending the rest of your life with this woman you have probably had your first fight. You either overreacted to something simple (guilty), been so over the top crazy you wonder how you are going to make it through (guilty again), or even just being scared about the future (guilty as charged). Whatever the fight be… if this is it, you will have a makeup portion. You will have to work through the fight together to get to the next stage. So how does this relate to the greatest day of your life when your other half says yes? Well…. see there is this thing called the Engagement high. It’s true and we get it. Feel free to also put a pin in this section for after the wedding because it all relates. You get engaged and everything is amazing. It is back to day one (kind of like the beginning of the relationship) you are in a whirlwind of Congratulations, When is the date, and you might even get asked if you know who your best man will be yet. The reality of it is there is going to come a point between your engagement and your wedding where your bride gets a little down in the dumps when the “realness” of the wedding curse words sets in. The high of the excitement from just getting engaged wears off and I hate to admit this (I am about to throw myself under the bus) but the shine wears off. It’s what you do once the new and shiny wears off that makes you the true “team”. All of these things can take a toll on a newly engaged couple. I am going to speak for all of us women out there when I say… be patient with our emotions. When you ask us to marry you you are also asking to MARRY THE CRAZY. We love you and won’t stop loving you, but sometimes we just need a hug and an it’s ok. If your bride is getting hit hard with this one it might be time to invest in calling a wedding planner. The wedding planner will help keep your bride excited and also not let her getting drug down by the less exciting details. Here in Arizona we like to work with Ashley Gain Weddings because is a ball of passion and genuine love for what she does. This is the type of planner you want your future bride to be celebrating with. Date nights! Wahoo! Nuff said. Be present in the wedding planning. Whether you think she does or not… she want’s you to be involved. Ask her what she is working on, can you help (and mean it), and be her partner. So to wrap it up, you don’t need the biggest ring or the perfect plan. You just need the real. The real is what is going to keep you together. However hard it is at times, the real will get you through. Don’t focus on the giant details of asking this amazing woman to marry you, focus on the details that count. The details that won her heart in the first place.If you look at her and think “Good God this one is the one” then you are already where we need you to be. If you can focus on her and the fact that she is already anxiously awaiting your proposal, then you will be just fine. You know how I know that? Because in the end the only thing that matters is her, because to her you are the only thing that matters. Please share your engagement stories in our comments below and if you liked our stuff please feel free to give us a share! Previous PostThe Post Wedding Day Coma: You're Married... Now What? Your Guide For After The "I DO"
I remember proposing to my wife almost 11 years ago today. We were in Italy doing our required cross-cultural experience in order to graduate from Lee University. We went to the Island of Capri for the day on New Year’s Eve 2004. While we were walking around with a couple of friends we came upon a big, beautiful yellow church. With yellow being Hannah’s favorite color I knew this was the right place to propose. I gave one of my friends my video camera and asked him to record me proposing to her. I got down on one knee, told her I loved her, and asked her to marry me. She said yes and we celebrated later that evening with everyone on our trip. OMG Josh Lipstone you are now just the cutest ever. This is amazing, thank you for sharing. My soon-to-be husband took me to a cabin in the north Georgia mountains to celebrate our anniversary. I love everything about north Georgia and it is where I like to spend my time. We get there and he tells me, “When you see them, flip them over”. I thought that was weird, but he is known to do very romantic/goofy things just to show me he loves me, so I thought very little of it. He had lined the cabin with photos of us (admittedly I have a problem where I take pictures of everything…including every date we have ever been on). Each picture had a caption with the first letter underlined and I thought he just did it for stylistic reasoning until I got to one that said “Uzis were not allowed at the football game”. I wracked my brain for what that meant, and then I noticed that the underline letters had spelled out “WILL YOU”. He made me keep going and by the end I was crying, and I turned around to see him on one knee. Obviously, I said yes. OMG! This is so amazing! I am in love with the two of you now. Isn’t it so funny how it’s the little things that stick with us?! I am so happy you shared this with us. Thank you and when is the wedding date?!!!!! !